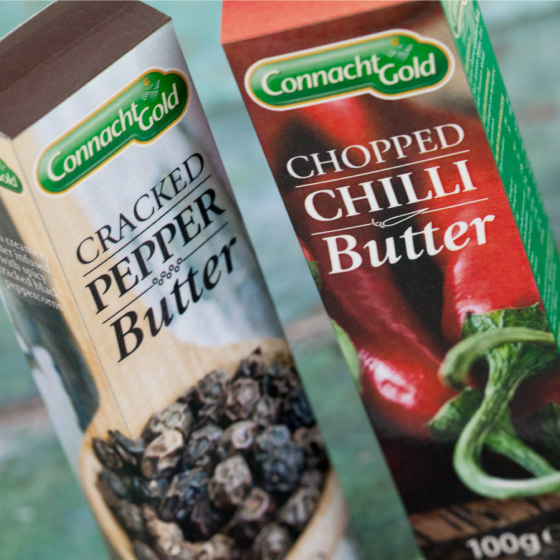 Connacht Gold flavoured butters are smooth, rich and beautifully blended with herbs and spices to bring out the best in your cooking. The distinctive 100g stock format is designed for ease of use in the kitchen while the traditional foil keeps the butters fresh in the fridge. Following the Garlic and Herb Butter’s win at the prestigious Gold at Blas na hÉireann Awards 2013 and subsequently the Great Taste Gold Award 2014 we redesigning the range to better represent their ‘foodie’ appeal using a full cover of delectable, cookbook style photography. This look was rolled out across two new variants, including the delicious Cracked Pepper Butter. All flavours are supported by full colour shelf ready packaging and an accompanying Point of Sale suite.